These engines have all been built to appear ( with the exception in most cases of the factory orange-painted exhaust manifolds ) O.E.M. correct as per typical factory production for the particular model year of Corvette. II know what you're thinking: Big Deal. There's no secret here. What's next? Click on the arrows to advance, and the thumbnails to view. Technology has moved forward some 30 to 50 years since these classics rolled down the assembly line, and in that time a vast number of improvements have been developed, tested and installed in today's cars. The Restoration Station is taking these tested components and blending them into the original platform of your classic Corvette. With the advent of roller cam technology, automotive manufacturers have been able to achieve great numbers in horsepower, torque and fuel economy from today's engines through more aggressive cam profiles never before possible. We have converted this solid lifter 327 to a full-roller valvetrain. Gone are the 3/8" press-in studs, flat tappet lifters that grind away at the cam lobes, and rocker balls that abrade the rocker arms. Note that our rockers are FULL-roller, not just roller tip. In are the 7/16" screw-in studs, push rod guide plates, and lifters and rockers with rollers that work without the heat and friction of your engine's original design. No need to worry about the zinc content ( or rather, the lack of it ) in today's motor oil causing flat-tappet camshaft failures. I know, you've heard that you can't put the stock valve covers over the full-roller rockers because they won't fit. Well, we're doing it, and we're doing it without spacers or extra-thick gaskets. We have developed and are manufacturing components that allow us to put your stock valve covers over today's improved technology. You end up with a totally stock-appearing original engine with the improvements of today's cutting-edge engineering! What kind of improvements? How about a broader power band and a free-er revving engine that doesn't build as much heat. A rather mild hydraulic-lifter 190 horsepower 350 in a '73, and a more aggressive L-46 350 horsepower 350 in a '69. What do they have in common other than the cubic inch displacement? They have both been to technology school and are now enjoying the advances of today's technology with better power figures and free-revving rollers. That, of course, is the small block. But what about big block applications? Here's a 454 that came to us with a bad cam. It didn't need an entire overhaul, so we simply upgraded to a full-roller setup since we had to change the cam anyway. Mouseover this picture to remove the valvecover and view the full-roller rockers. Here's a '67 427 / 390 horse built, you guessed it, full-roller. The beauty of it all is that it maintains the stock outward appearance while adding so much to the inside. What else are we doing? 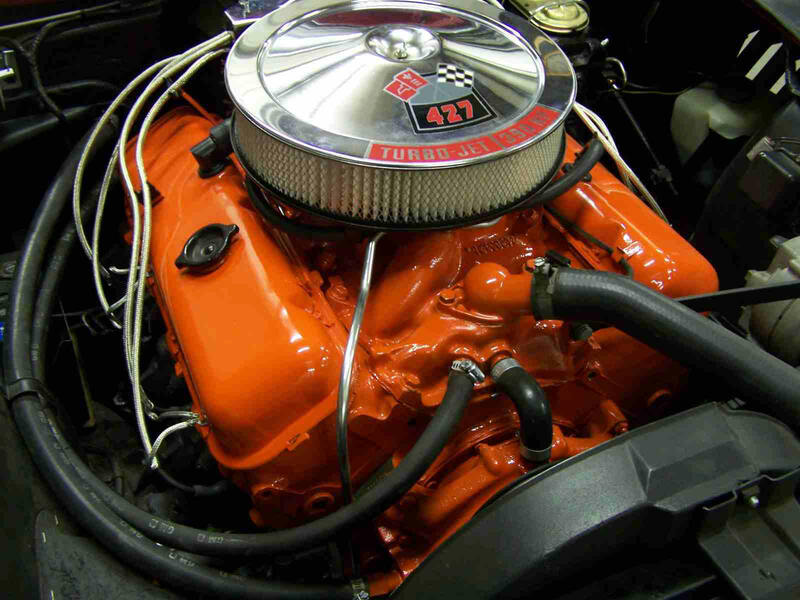 How about a Chevrolet Performance Parts ZZ383 crate engine ( that's 425 HP and 449 lb.ft. of torque ). Imagine this kind of power at the end of your accelerator - especially when coupled with a Tremec 5-speed transmission, which will give you awesome throttle response through the lower gears, and low RPM overdrive gear cruising on the highway to take you to the Corvette show three states away. Don't worry about carrying fuel additives with you; your power plant is pump-gas friendly! How about adding some creature comforts like air conditioning and power steering. Rack and pinion? No problem. The ZZ383 just as it arrives with the aluminum Vortec heads already commanding attention. Scroll over the image with your mouse to take a peek at the beautifully engineered full roller valvetrain beneath the cardboard lifter tray and stamped-steel valve covers. The intake runners of these special heads are .240" taller than stock small block Chevy ports - for extra breathing. You would love to do something like this, but the purist in you won't let you? How about this engine looking period-correct for your vintage Corvette? In fact, it would be all dressed-up with all of your original components, such as early Corvette intake, ram's horn exhaust manifolds, valve covers, fan, short style water pump, pulleys, distributor, ignition shielding, and air cleaner to look like it belongs in your Corvette's engine compartment. Problem: The ZZ383 has aluminum Vortec fast-burn heads, and the stock aluminum Corvette intakes won't fit. Solution: The Restoration Station. Once again, we have developed and are manufacturing an answer to blend the old with the new. Mouseover the image to have a look at the "Vintage" starting to come through. OK, so you put your purist tendencies aside and just want to enjoy your Corvette? Here's a ZZ-4 that we've done that's dressed to the nines. Three hundred and fifty five horsepower, pump gas friendly and a look that will blow you away. An in-tank fuel pump, a pressurized fuel rail with a return system, a dual-sync distributor and sequential tuned port fuel injection? That's ok, we can keep up. Want the ultimate? Ask us about a new '08 LS-3 drive-by-wire engine under the hood of your Corvette, or a C4 chassis beneath your feet to roll down the highway. With these engine / transmission swaps, and chassis component replacements, how can someone treat an American icon such as a Corvette with such irreverence? Actually, it's just the opposite. Quoting the NCRS; the "National Corvette Restorers Society is dedicated to the restoration, preservation, history and enjoyment of Corvettes...". What a better way to both enjoy and preserve than to substitute valuable components with widely-available pieces so you can drive with peace-of-mind. More and more classic Corvette owners are "tagging and bagging" their original engines and transmissions in order to preserve them - to be able to drive their classic icon without the worry of damaging (perhaps beyond repair) their original numbers-matching components. What a better place to have this done than one where the man at the helm is an active, longtime (20 year) NCRS member and judge, with the shop rule that we won't do what can't be put back. The words "no bridges burned" live and breathe in the credo of The Restoration Station.